This component can load data stored in an Office Open XML Excel sheet into a table. This stages the data, so the table is reloaded each time. You may then use transformations to enrich and manage the data in permanent tables. By default, data types are guessed by looking at the cell formatting, not cell contents. This is controlled using the Connection Option "type detection scheme" which can be set to ColumnFormat (the default, which examines the cell formatting), RowScan (which will scan 15 rows of data and guess the data type based on the data values), or None (treat everything as text). A second connection parameter, "row scan depth" controls how many rows to scan when determining column types. None is often a sensible choice if you intend to parse the values later anyway or the types in a single column are mixed. The component offers both a Basic and Advanced mode (see below) for generating the Excel query. Advanced - This mode will require you to write an SQL-like query. The worksheets become table names, and the columns are either A, B, C... or use the first row as column names depending on the setting of the "Header" connection option. Storage Type Choice Select between Amazon S3, Azure Blob and Google Cloud Storage as the host of your excel file. Storage URL Text Enter the full path where your .xlsx file can be located. Only Office Open XML (.xlsx) files are supported. Storage containers are explorable here if your credentials include access to resources of the selected Storage Type. Contains Header Row Choice Yes - The first row of data is the column names. Cell Range Text By default the whole worksheet is considered. However, you may optionally specify a range of cells instead. For example, A5:E100 would only consider rows 5-100 in columns A-E. Wildcards (*) are also supported, for example A5:E* would consider columns A-E and rows 5 onwards. Data Source Choice Select a data source. Each sheet in the workbook is exposed as a table. Data Selection Choice Select one or more columns to return from the query. These may be A, B, C or the first row may be used as a header to provide column names. See the "Header" connection option. Limit Number By default, all rows are returned, but you can use this to limit the number of rows loaded. Value A value for the given Parameter. The parameters and allowed values for the Excel provider are explained here. Table Distribution Style Select Even - the default option, distribute rows around the Redshift Cluster evenly. Download the files from storage to a temporary area on the Matillion instance. Query the sheet and stream the results into objects on storage, recreate or truncate the target table as necessary and then use a COPY command to load the storage objects into the table. Finally, clean up the temporary storage objects. In this example, the Excel Query component is used to create a table populated with sales data from an excel file (.xlsx). The table data is then passed through a simple filter. Bringing data into a table requires an orchestration job, while filtering said data requires a Transformation job, seen below to the left and right, respectively. The orchestration job requires 3 components: Start, Excel Query and Transform Data. Start requires no parameterisation and Transform Data should simply be given the name of the Transformation job. The Excel Query component must be given the path of an existing .xlsx file and the name of the table to write this data to. If the table name does not exist, Excel Query will create it. If the table does exist, Excel Query will overwrite it. In this example, an .xlsx file is taken from an S3 bucket using the Excel Query component set up as below. Since we want to grab all of the data, we needn't alter the 'Cell Range', 'Data Source Filter' and 'Limit' properties. The data is being written to a table by the name of 'excel_example', which can be done immediately by right clicking the component and selecting 'Run Component'. This example is particularly apt when you wish to import Excel data to a table with no serious alteration of the source material. Ensure each property has 'OK' status before continuing. After this component has run, a table named 'excel_example' will exist in the specified staging area and can be used in transformation jobs. In this example, the excel_example table data is loaded using the Table Input component. Selecting the 'Sample' tab for the Table Input component allows the user to 'Retrieve' rows and a total row count and we can see from the sample below that the data has been read in correctly. 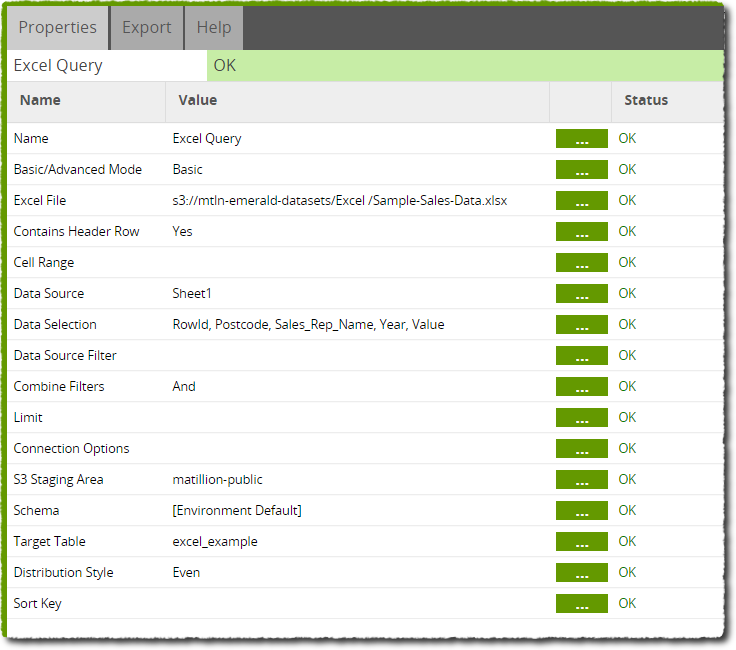 Note the columns match the names found in the 'Data Selection' property of the Excel Query component. The Filter component is used to find only the data where Jane is the sales rep. Editing the 'Filter Conditions' property of the Filter component allows a new filter to be added, in this case one to check sales_rep_name is equal to 'Jane'. Finally, the Filter component's Sample tab can be viewed to ensure the table data is being filtered correctly. As expected, the sample shows only rows where Jane is the sales rep. In the previous example, a Filter component was used to take a subsection of data from a table of excel data. In this example, we see how the Excel Query component can be used to do this directly without need of a Transformation job. Editing the 'Data Selection' property of the Excel Query component will bring up a filter similar to that of the Filter component. In the same way, we filter only for values where the sales rep name is Jane. Note the component (or job) must be rerun for this new data to overwrite old data and provide a sample. 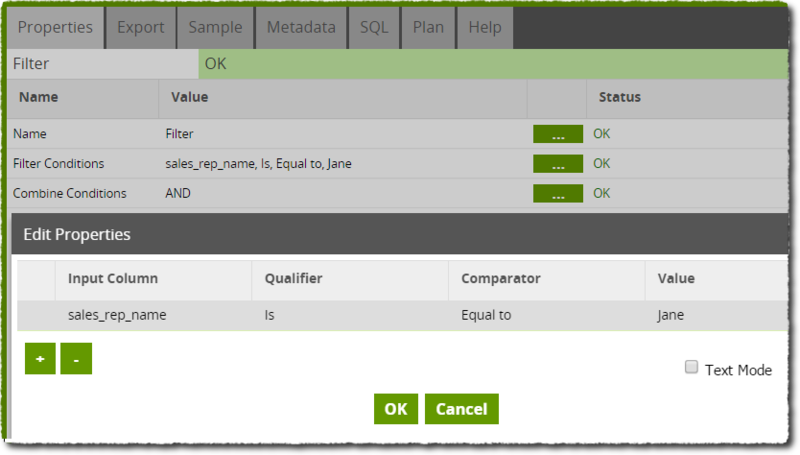 An inspection of the resulting table (using a Table Input component to sample the data) shows that the Data Selection has been successful and only rows containing transactions by Jane are imported. Is useful, using the wildcard value for rows. Column E is then lost. Upon entering this Cell Range, the component may recognise an error in the Data Selection property as it expects the 'Value' column that we have now omitted. Editing the Data Selection property can fix this error. 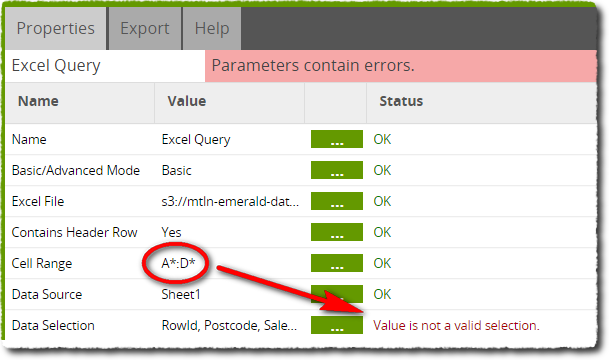 This same error may appear if you attempt to reuse the same Table Input component to view a sample, as it may expect a column that no longer exists, but can be remedied in the same way. Again, inspecting the sample data for this table confirms the success of our new Excel Query properties.